The Jazz are back and are looking to make some noise in the Western Conference. Led by a highly talented up and coming roster, Utah will battle to reign atop of the Northwest division and bring home an NBA championship. Division rivals, the Oklahoma City Thunder and the Denver Nuggets will seek to spoil the Jazz's plans. Grab your Utah Jazz tickets and head to the Energy Solutions Arena and lead your team victory. After not performing as well as they would have likedto between 2012 and 2015, the Utah Jazz finally qualified for the playoffs in the 2016-2017 season. The team lost to the Golden State Warriors in the Conference Semifinals. The Jazz also qualified for the playoffs in this most recent season. The Jazz went head to head with the Thunder in the First Round and ended up beating Russell Westbrook and his team 4-2. In the Conference Semifinals, Utah faced Houston and sadly fell to the Rockets, losing the series 4-1. The team is now preparing for the 2018-19 campaign which is scheduled to begin in October. The Utah Jazz have provided many memorable moments since their inception in 1974. Let’s take a look at some of them. Appearing in the NBA Finals for the First Time – The 1996-97 season is a special one for the Utah Jazz fans. That year, theymade it to the playoffs and won a division title and aconference crown. Moreover, they defeated teams like the Los Angeles Clippers, 3-0, the Los Angeles Lakers, 4-1 and the Houston Rockets, 4-2 to face the Chicago Bulls for the NBA Championship. This was their first appearance in the NBA Finals. That is as good as it got for the Jazz however and they lost to the Bulls, 4-2. 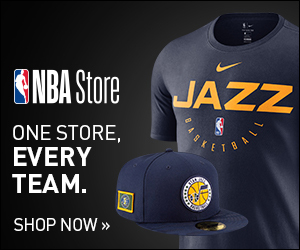 John Stockton Sends the Utah Jazz to the NBA Finals – Another moment that Utah Jazz fans will never forget is when the veteran point guard, John Stockton sent their team to the NBA Finals in the 1996-97 campaign. It was the Jazz vs the Rockets in Game 6 of the Conference Finals when Stockton hit an incredible shot in the closing moments of the game. That shot sealed the win for the Utah Jazz and sent them to the NBA Finals. The Utah Jazz share intense rivalries with the likes of the Houston Rockets and the Golden State Warriors. Jazz-Rockets Rivalry – The rivalry between the Utah Jazz and the Houston Rockets started in the 1990s. During that decade, these two sides played each other in the playoffs on four occasions. The Jazz won two series, while the Rockets clinched the other two. This rivalry was reignited in 2007 and 2008 as the Jazz and the Rockets met again in the playoffs.The Jazz won both times. Jazz-Warriors Rivalry – The seeds of this rivalry were planted in 1987. That year the Warriors eliminated the Jazz from the playoffs. Since then, these two sides have encountered each other three times in the postseason. This rivalry became intense when the Jazz defeated the Warriors in Conference Semifinals in the 2006-07 season. However, in 2016-17 these sides met again for the Conference Semifinals, but this time the Warriors were able to exact revenge and won, 4-0. Over the years, a lot of star players have played for the Utah Jazz and John Stockton is one of them. He became a part of the team in 1984 and remained with the Jazz till his retirement in 2003. During this time, Stockton appeared in ten NBA All-Star Games. He also made it to the All-NBA First Team twice in 1994 and 1995. To honor him, the team not only retired his number 12 but also inducted him in Utah Jazz’s Hall of Fame in 2009. Karl Malone is another star who played for the team from 1985 to 2003. While he was a part of the Utah Jazz roster, he was picked to appear in fourteen NBA All-Star Games. Moreover, Malone was selected in the All NBA-First Team eleven times. He also received The Southland Conference Men’s Basketball Player of the Year Award in 1983. Then there is Pete Maravich who played for the Utah Jazz from 1974 to 1980. He achieved many milestones throughout his career. While playing as a Point Guard in Utah, he was picked to appear in four NBA All-Star Games in 1974, 1977, 1978 and 1979. The Jazz have also retired his number 7 in his honor. Sharing the rabid Utah fan base with just one other professional team, Real Salt Lake, the Jazz are an enormous source of pride in Salt Lake and beyond. Playing their home games at Vivint Smart Home Arena, the Jazz enjoy some of the best fan support in the league. Patrons also relive Utah history with commemorative statues of legends, John Stockton and Karl Malone. The Utah Jazz surprised their fans by making it to the playoffs two years in a row. They are now looking to carry that momentum into the 2018-19 campaign which is just around the corner. If you are planning to watch them perform live then grab your Utah Jazz tickets 2018. Our process for purchasing cheap Utah Jazz tickets is simple and fast. There are so many online ticketing sites, that it can be hard for customers to find the right place to buy Utah Jazz tickets at the cheapest price. At ScoreBig we think of our customers first and foremost. We offer daily deals for Utah Jazz events, so our customers can get the best seats for the best prices. ScoreBig will always go above and beyond to offer the cheapest Utah Jazz tickets on the market. The Utah Jazz schedule above, displays all available events for 2019 and 2020. Once you find the event that you would like to go to, click the red “Get Tickets” button. It is located on the right-hand side of the event listing, it will take you to an Utah Jazz event ticket page. ScoreBig's event ticket page will display all available Utah Jazz tickets for that event. On the event ticket page to help with your search for the right Utah Jazz tickets, use the filters at the top to select quantity, price range, and more. There is also an interactive seating chart so you can pick where you want to sit. When you are ready to buy a ticket, click on the listing, and you will be directed to ScoreBig's checkout page. Upon completion of the information fields, your order will be processed and your Utah Jazz tickets will be delivered via email, mail, or to your mobile device. What makes ScoreBig’s site stand out from the rest? We are constantly analyzing our competitors to improve our site, service, and prices. ScoreBig.com employees strive to offer the best process and experience to buy cheap Utah Jazz tickets. Our goal is to get you the best seats to Utah Jazz events. We offer daily discounts on our site and for special promotions check out our newsletter. If there are no Utah Jazz events currently available, you can use our search feature at the top of the page to see a list of all popular events going on near you. No matter your price point, we have all the best deals and discounts on Utah Jazz tickets. For more information on prices of Utah Jazz tickets and the schedule for Utah Jazz, check out our listings above. The last thing you want to find out is when the Utah Jazz event you wanted to go to is sold-out. Don’t worry in many cases ScoreBig has affordable tickets to sold out events. We sell tickets from GA all the way to premium seating and parking. Skip the scalpers in the parking lot and get your tickets online from top Utah Jazz ticket brokers. We get you in all events, buy your Utah Jazz tickets here from a brand that many trust and rely on for all their ticketing needs. ScoreBig offers a 100% money-back guarantee. If you have been in search of cheap tickets for Utah Jazz, ScoreBig by far is the best option. That’s why ScoreBig has more loyal customers than any other ticketing site. Shop at ScoreBig for safe and secure Utah Jazz event tickets.